The first 21 treatments of this trial were initiated on June 17th. Treatments 22 through 25 were initiated on June 24th. Subsequent applications were made on various schedules which are presented in the table shown below. 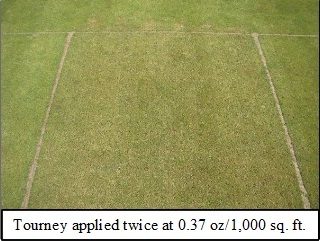 The trial was conducted on an annual bluegrass putting green located at the OSU Lewis-Brown Horticulture Farm in Corvallis, Oregon which is approximately 60 miles south of Portland. The green was built in April of 2009 using the California Method (12” of USGA sand placed over flat drainage laying on a soil sub grade). Annual bluegrass cores from aerification were placed on the surface and then rolled. Subsequently, the green was repeatedly topdressed to obtain a smooth surface. The cores came from Emerald Valley Golf Course in Cresswell, Oregon where they have had a history of anthracnose problems and documented resistance to strobilurin and benzimidazole fungicides. * Note: The label for Torque (Trt 13) restricts the retreatment interval to a minimum of 28 days. ** Note: Treatment 25: Honor + Revolution applied first on 6/24 (wait 4 weeks), then applied Trinity on 7/22 (wait 2 weeks), then applied Insignia SC + Revolution on 8/5 (wait 3 weeks), then applied Trinity on 8/26 (wait 2 weeks); and lastly, applied Honor + Revolution on 9/9. 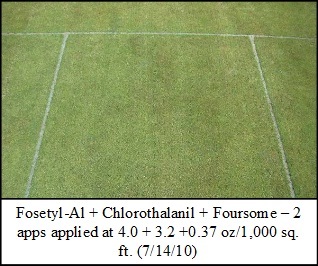 Since the turf is not inoculated with the anthracnose fungal pathogen, the general goal of turf cultural practices when conducting an anthracnose trial is to encourage the natural onset of the disease by stressing the turf with lower mowing heights, limited nitrogen, and either too little or too much water. However, it is a balancing act because unduly stressing the plots causes all the plots to deteriorate thus losing any ability to distinguish between plot quality differences resulting from the fungicide treatments. With this goal in mind, the plots were mowed Monday through Friday at .095 inches using a Toro Flex walking greens mower. Irrigation was applied using a RainBird irrigation system with Hunter I-20 heads. At the onset of the trial, Irrigation was set to apply 80% of ET (calculated from an on-site weather station). Irrigation was subsequently reduced until drought symptoms began appearing in the afternoon at which time the dry spots were hand watered. The plots were fairly lean when the trial started. One fertilizer application was made on July 14th applying 0.25 lb of soluble nitrogen from Anderson’s 28-5-18 + micros fertilizer. 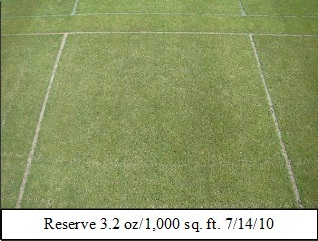 The individual plots measured 25 square feet (5 ft X 5 ft). The sprayable products were applied with a CO2-powered sprayer using TeeJet 80015 nozzles at 30 psi producing a total spray volume of two gallons per 1,000 sq. ft. The granular products were applied with a hand shaker can. Visual disease severity and plot quality ratings were taken on July 1st, July 14th, July 28th, August 11th, August 26th, September 9th, and September 30th. 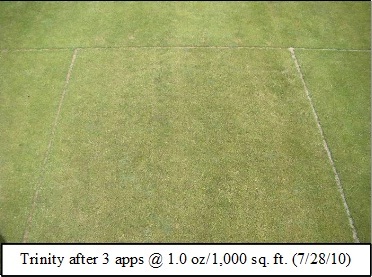 Turf Quality and Percent Green Cover ratings were based on digital photographs taken on the same dates and analyzed using Sigma Scan Pro software from SPSS, Inc (See Karcher, D.E. and Richardson, M.D. 2003. 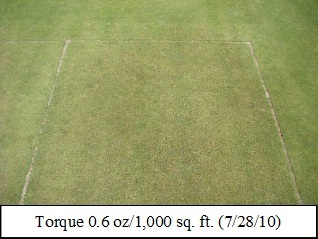 Quantifying Turfgrass Color Using Digital Image Analysis. Crop Sci. 43:943-951). Data from each rating date were subjected to analysis of variance using a randomized complete block design with 3 replications. Differences between means were determined by Fisher’s LSD at the 5% level. Unfortunately, because of the late cool wet spring weather and the generally moderate temperatures this summer, significant anthracnose symptoms did not develop. However, there were significant plot quality differences. Additionally, there were differences in PGR effects related to the DMI fungicides that were applied – propiconazole (Concert and Headway), triticonazole (Trinity, Triton FLO, and Reserve), tebuconazole (Torque), and metaconazole (Tourney). Most of the negative DMI effects were brought on by repeated applications, in addition to, three hot days from July 7th through the 9th (temperatures reaching 94 degrees) corresponding with the 4th application date. 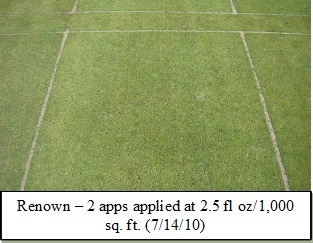 As far as overall plot quality, all the products, with the exception of some of the DMI’s, provided good turf quality. Many of the treatments performed very well including the two Renown treatments (Trts 4 & 5) along with the Signature + Daconil treatment (Trt 21), and the four treatments that included Foursome (Trts 17 through 20). Renown is a mixture of Heritage plus Daconil and Signature includes StressGard which is a blue pigment that darkens the turf color. Foursome is also a blue pigment that is being sold by Quali-Pro as a spray indicator. Foursome darkened the turf in a similar manner as the StressGard in Signature. It is important to keep in mind that when testing fungicides and other products on anthracnose, the turf is purposely stressed and under fertilized, as mentioned earlier. 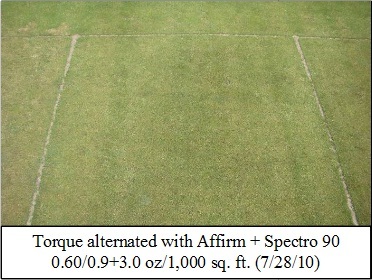 These conditions tend to cause the turf to yellow somewhat, and thus, maximize the color difference between plots treated with and without a pigment. Also, Foursome is not a fungicide and will not likely control anthracnose by itself. Other treatments that performed very well were the Spray Programs 1, 2, & 3 (Trts 6, 11, & 12) and the combination of Honor + Revolution (wetting agent) (Trt 23). 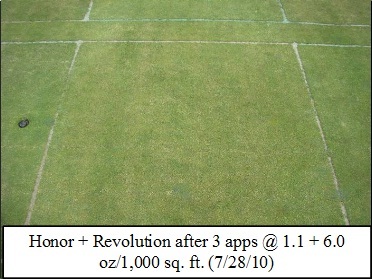 Most of the DMI’s in this trial caused some turf problems related to the well documented growth regulator effect. As mentioned above, these problems were caused primarily by repeated applications made through the summer on a 2 week spray schedule and a short heat spell that coincided with the 3rd application date. These problems were mostly manifested as turf browning which ranged from slight to severe. Tourney caused significant phytotoxicity to the turf after two applications (see photo at right) before the hot weather arrived. Applications of Tourney were stopped for 6 weeks and the plots recovered. The Tourney applications were resumed again on August 12th and the plots only had a very minor brown tinge after three applications. Torque and Trinity had some moderate browning primarily following the third application. Reserve, which is a mix of Triton FLO and chlorothalanil, had some discoloration but the browning was limited because of the StressGard pigment included in the Triton FLO. 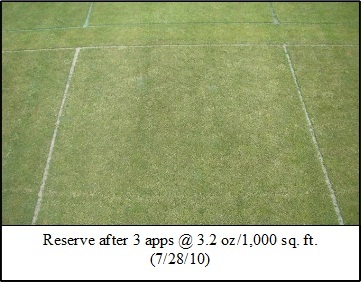 However, after the short heat wave, the plots treated with Reserve had a strange white “tinge” to them (see photo below). 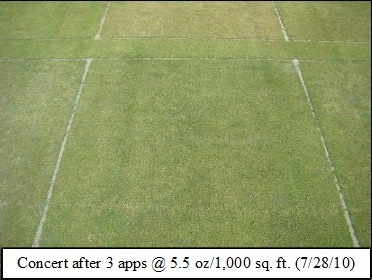 Concert applied at 5.5 ounces, which includes Banner Maxx, had very little DMI effect in this trial. Headway G, which also includes Banner Maxx, had some brown tinged spotting which appeared to be caused by higher concentrations of the fungicide around the individual granular particles. This effect is similar to the dark green spotting that occurs when granular fertilizers with a high nitrogen percentage are applied at low rates. In order to try and quantify the PGR effects from the DMI fungicides, we decided to measure percent green cover using Digital Image Analysis. Lower percent green cover rating equated to more phytotoxicity or DMI effect. The hue setting was chosen so the best plots would have a percent green cover rating near 100%. With this setting, the untreated plots averaged 94 percent over the duration of the trial. Minor DMI effects resulted in ratings in the upper 80’s to low 90’s. Moderate DMI browning resulted in a percent green cover in the low to mid 80’s. Severe injury rated in the 65 percentile range. 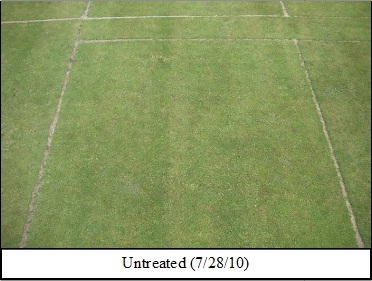 The results of this trial illustrate the importance of limiting use of DMI fungicides during the summer months. Our recommendation would be to use them early in your rotation (May and June) and to space two DMI fungicide applications at least 28 days apart. Additionally, do not use DMI fungicides if the weather near the application dates is expected to be above 85 degrees. ** Note: Tourney applied twice (6/17 & 7/1) and then applications were ceased for 6 weeks. Applications began again on August 12th.